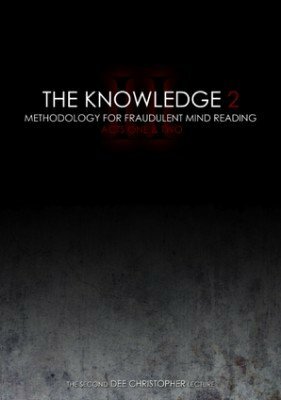 The Knowledge 2 is the anticipated follow up to the original set of lecture notes The Knowledge from Dee Christopher. In this second set of notes, seven more unique concepts are attacked and many more effects are shared. The focus here is on unique gimmicks and utility items as well as effects with these tools. There are two gimmicked decks taught, a prediction utility item that can be applied to almost anything, an amazing forcing concept based on an old magic effect turned on it's head, a shuffle-ready deck stacking system, two envelope based prediction systems that are both very easy to do and real workers and a gimmicked pad that could become an entire act for you. The PDF book is separated into two sections, ACT I covers six unique mentalism concepts and ACT II is dedicated to Broken Wings. The performer deals a few index cards off the top of the stack. Say six of, for congruence. An ESP symbol or word is written on each card. They are all shown to the participant and then turned face down and mixed. A prediction is written on a post-it note and folded up. This can be handed off to a third party or lain on the table. The Participant is then asked to choose a card without thinking and to lay that face down on the table next to the prediction. The prediction is opened by the participant and read aloud. The card is then turned over and seen to match and everything is left completely examinable. Ex is a utility gimmick to mark a prediction. The EX gimmick allows you to have an “X” marked in electrical tape on any predicted item. The performer talks about intuition, chance and that little feeling we get when we know something is right, or wrong. A deck of cards is introduced and legitimately shuffled. Half the deck is put away to streamline the demonstration. The other half is then handed to the spectator and the performer offers his/her outstretched palms as a surface to deal on to. The spectator deals the cards into two piles about equal amounts of cards in each, but in no specific order. Once all the cards are dealt, the performer shows that in one pile all the reds have been dealt, in the other all blacks! The spectator has managed to separate the cards, without knowing how. Easy to do, perform it the same day it arrives. Unlike other OOTW effects, this is done in the hands, so is ideal for walk around performers and creates a great visual for those watching. You can still perform the rest of your repertoire without having to switch in a gimmicked deck – All you need is the Dichotomy deck. A small envelope is laid on the table. It’s said to contain four aces, one of each suit from a standard deck of playing cards. A lighter is handed to the participant and they are asked to name any of the four suits. You mention that using that very lighter; you burnt across the face of one card previously. They hold the lighter and name a suit. Hearts, for instance. The cards are dealt out of the envelope one by one and the envelope tipped to show that it’s empty. The cards are turned over by the spectator; the only card with a burnt face is seen to be the ace of hearts. A deck stacking system that allows for an amount of legitimate shuffling and an easy location of a selected card or cards out of sequence. This device is a gimmicked pad. It's simple in it's workings, but since it's conception 2 years ago, Dee has used it everywhere, from nightclubs to stages with great success. There are no complex mechanisms to go wrong, no technology to fail, this is a pure, invisible gimmick which allows you to achieve a multitude of impossible effects with ease. 8 full Broken Wings routines are taught showing the ins and outs of just what this amazing device is capable of. There is also a short video included to show the simple 'move' required. The Knowledge 2 is packed full of solid tools that you could base your entire act on. These are tools that Dee still uses day in, day out. 1st edition 2011; 43 page.